Are you a business user? Do you want to run hundreds of searches per month? Then KnowThyCustomer is perfect for you. We’ve recently re-branded BV Pro to become KnowThyCustomer: The world’s best customer intelligence platform. Learn more about existing customers. Find new ones by generating more leads. Verify customers, match transaction data and mitigate fraud risk. 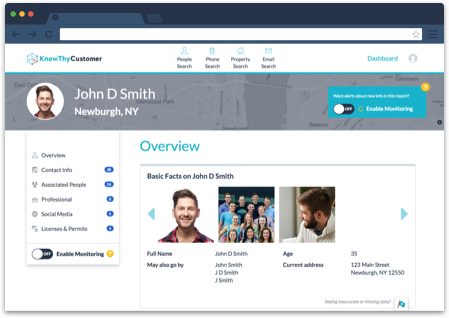 Enhance your CRM by matching people to email addresses and phone numbers. A great tool for your sales team.